There are several reasons you might want or need gluten-free baby food for your infant or toddler: she might already be diagnosed with celiac disease or non-celiac gluten sensitivity, she may be at high risk for one of those conditions or for another autoimmune illness, or you might already keep a gluten-free kitchen for yourself or other family members. Regardless of the reasoning behind your decision to seek out baby food that doesn't include wheat, barley or rye ingredients, there are several options for gluten-free baby food. Some companies make no gluten-containing products at all (obviously minimizing the risk of gluten cross-contamination), while others make only a small handful of products that don't include gluten ingredients. Read on for the details below. Of course, you'll need to use your own judgment as to which of these suits your family best, depending on your child's and on your family's health. Beech-Nut, with its slogan "Real food for babies," produces about a dozen products that contain gluten, all from wheat, according to a company representative. The wheat-containing products are mainly baby cereals, although there are several yogurt blends that contain wheat, too. All wheat ingredients are disclosed on the product label, as is required by U.S. allergy law. The rest of Beech-Nut's products are considered gluten-free, although they are made on the same equipment as the gluten-containing products, the representative tells me. "The raw material ingredients that are allergen associated are kept in a separate storage area to prevent cross-contamination," the representative says. "We have a third shift of employees that are dedicated to cleaning the production lines thoroughly from beginning to end. We then test for any allergen residue." Beech-Nut also makes a couple of baby food products that contain oatmeal, which can be quite cross-contaminated with gluten grains. If your baby needs to be gluten-free, I'd steer clear of those products, as well. Earth's Best organic baby food is made by a division of Hain Celestial Group, which also owns brands such as Rice Dream and Arrowhead Mills. The company makes five foods (mainly for toddlers) that it considers gluten-free. One product—gluten-free Wholesome Morning hot cereal, made from quinoa, brown rice and sweet potato—is certified gluten-free by the Gluten-Free Certification Organization, which requires products to contain less than 10 parts per million of gluten (less trace gluten is better). The other four gluten-free-labeled products include: gluten-free baked chicken nuggets, gluten-free baked broccoli and cheese nuggets, gluten-free baked sweet potato nuggets and gluten-free French toast sticks. These products, which are not certified gluten-free, can contain up to 20 parts per million of gluten. Ella's Kitchen, another organic baby food company, makes a variety of baby and toddler products, some with interesting flavors such as Full of Sunshine Thai curry vegetables with Rice and Totally Cool Vegetables and Chicken with Mangoes and Spices. The company offers more than 30 products considered gluten-free, including the curry and vegetables/chicken with mangoes and spices combos. All are gluten-free to less than 20 parts per million of gluten, and you can identify them on Ella's Kitchen website, using the filter for special diets. The gluten-free foods are produced on the same equipment as the gluten-containing foods, with protocols in place to limit gluten cross-contamination. When you think of baby food, you may think of Gerber, a ubiquitous brand owned by Nestlé. Gerber makes a huge variety of products aimed at babies to young children. According to the company, Gerber will clearly label all gluten-containing ingredients, and will note any potential problems with gluten cross-contamination on its labels as well: "Our gluten labeling policy for Gerber products is as follows: Gluten-containing ingredients (such as wheat, rye, and barley) are always listed in our ingredient statement when used as ingredients in our products. We also label gluten-containing ingredients from indirect sources (for example as a result of contact during harvesting, manufacturing or transport of ingredients) if the finished product could contain 20 ppm (parts per million) gluten or more." You should assume those Gerber products without gluten ingredients or labeled gluten cross-contamination can be produced in the same facility and potentially on the same equipment as gluten-containing products, although Gerber has a protocol in place to clean up allergens between runs of products. Gerber does use GMO ingredients for many of its products, but also makes a line that's certified organic, without any GMO ingredients. This line of "organic superfoods" makes products for babies, toddlers and younger children. Almost all Happy Family products are considered gluten-free, although one or two (cereal products) that include no gluten ingredients actually aren't considered gluten-free due to potential gluten cross-contamination. On its cereals, Happy Family states: "Our oatmeal and multigrain cereals do not contain wheat explicitly, but the grains used in the cereals are milled in the same facilities that mill wheat. Therefore, there is a small potential for cross-contamination, and we have chosen to not label them as gluten free. Our brown rice cereal is gluten free, however, as the grains are processed in a separate facility." Peter Rabbit Organics, a whimsically named, small organic company, makes fruit snacks and veggie blends for babies and toddlers. Combination flavors include mango, bananas and oranges, plus kale, broccoli and mango. The company does not label its foods gluten-free and does not make any gluten-free claims. But it also does not include gluten-containing ingredients in any of its products (for example, the ingredients on its kale/broccoli/mango mix include organic kale, organic broccoli, organic banana, organic mango and lemon juice concentrate). According to the company: "Our products are not processed on a line that processes gluten and there are not any products with gluten being made in our facility. After every production run, we perform a thorough wash-down of the production line to prevent cross-contamination of ingredients. Our manufacturers comply with a certain standard of maintaining the production line." Plum Organics, a subsidiary of Campbell Soup Company, is a Public Benefit Corporation, which is a company that voluntarily meets higher standards of corporate purpose, accountability and transparency. For Plum Organics, this means fighting malnutrition by "donating nourishing organic food and promoting nutrition education." The company has developed a super smoothie of organic fruits, veggies and grains to help fortify the diets of children who don't get regular healthy meals. Many of Plum Organics baby and toddler foods don't contain gluten ingredients; an updated list is available on the company's website. However, a company rep warns: "Please note that products that do not contain gluten ingredients may still share processes and equipment with gluten-containing ingredients and products. Because consumer safety is our primary concern, we only promote products as gluten-free when we can guarantee compliance with our standards in this area." 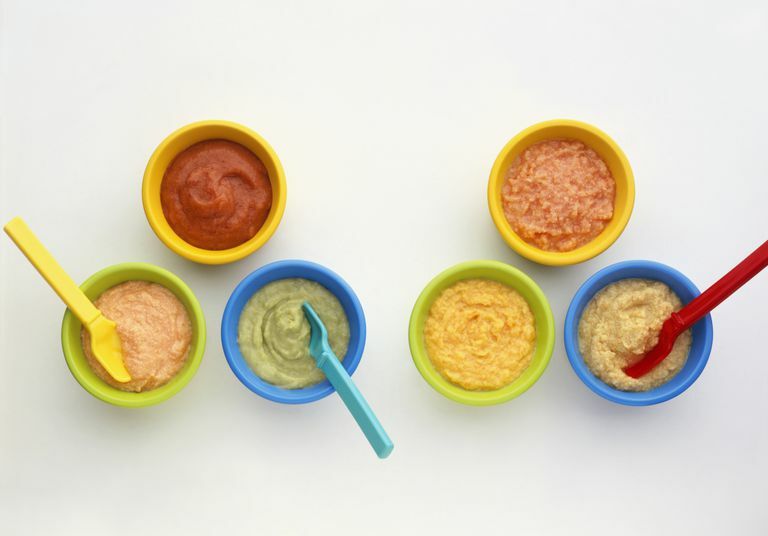 If you want to be absolutely certain what you're feeding your baby, it's not that difficult to make homemade baby food. As a bonus, you'll know it's gluten-free because it's coming from your own gluten-free kitchen. If you don't want to take that step, you can stick with gluten-free baby food products from: Earth's Best, Ella's Kitchen, and Happy Baby Brands. Peter Rabbit Organics products also are at very low risk for gluten cross-contamination, even though they're not specifically labeled "gluten-free."